Tommy, who is just eighteen years of age, has made quite an impact since turning pro in November last year. In just his first fight the teenager showcased his immense punching power, by stopping his opponent, Lithuania’s Artur Saniuk, in the first minute of the third round. Then just last month the former St Ives Boxing Academy captain showed his maturity, by boxing smart, against the highly experienced Jason Nesbitt from Birmingham, to secure a shutout 60-54 points victory, not too shabby at all considering Nesbitt’s experience and size, Nesbitt weighed-insome seven pounds heavier than Tommy. With the prospect of fighting on his first televised event an ebullient Tommy said. 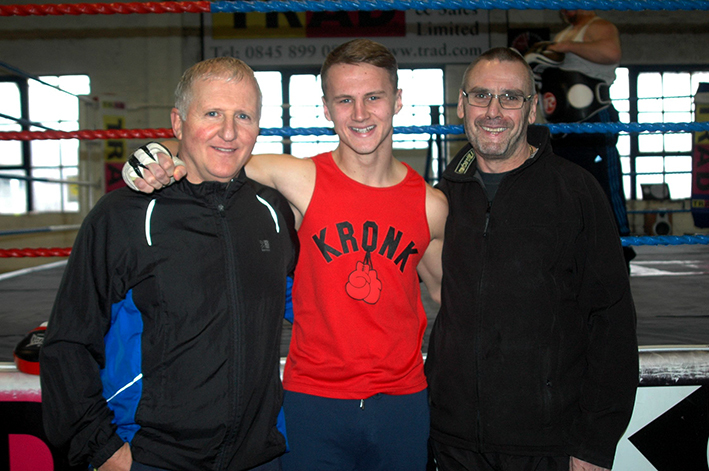 “I’ve been with Johnny (TRAD TKO’s Johnny Eames) six months now and already have my third fight coming up on the 15th. It’s on the Frank Maloney Loaded and Dangerous In London show at York Hall, this will be my first televised show and it’ll be on Loaded TV. To be honest I had just finished my second fight and as soon I came to collect my money from Johnny he said straight away we’ve got another date. I’d literally just come back up to London, I stay here five days a week and go back home to Cambridge at weekends, so I went straight back into camp for another six weeks to prepare for the 15th March. I have really good backing, since my last fight I’ve done 250 tickets now, so hopefully after this fight, if they keep getting televised, things will only get bigger and better. With a good headlining act it hopefully helps me sell a lot more tickets, no offense to Miranda Carter shows but without a big attraction headlining it makes it hard to sell tickets, as I don’t just sell myself, I sell the show. It’s the same with my training, I live the life, it’s the whole thing, so I live in London during the week so can concentrate on honing my skills and improving my fitness. If you don’t live the life you soon get found out, that’s the truth. I came to the TRAD TKO for my first couple of weeks sparring and found it really, really hard, but since I’ve been living the life as a professional, being in the gym five days a week it really begins to show itself in the ring, there’s no hiding place in there. Tommy Martin, against a yet to be named opponent, features on the undercard of Matt Skelton versus John McDermott for the vacant English Heavyweight title at York Hall, Bethnal Green in London on Friday 15th March 2013, which will be broadcast live and exclusive on Loaded TV (Sky platform channel 200). Tickets, priced £30 and £70, for the Frank Maloney promoted ‘Loaded and Dangerous In London’ event at York Hall on Friday 15th March, are on sale now at www.tkoboxoffice.com or direct from Tommy Martin at the TRAD TKO Boxing Gym, Gillian House, Stephenson Street, Canning Town, London E16 4SA.